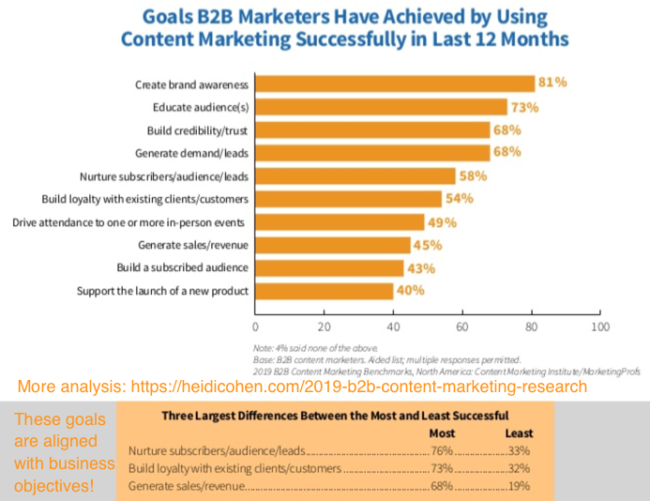 Want your content marketing to succeed in 2019? 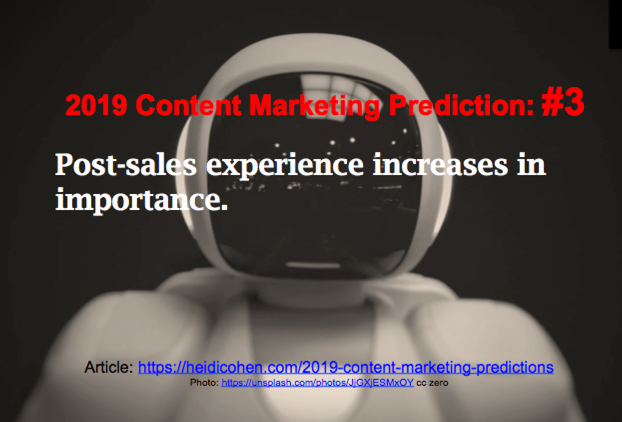 Then, first consider how key events of 2018 will influence your marketing and content performance. 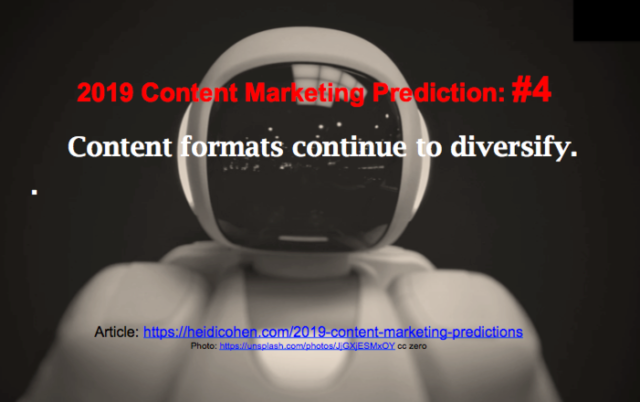 Based on significant shifts in the 2018 landscape, these ten 2019 Content Marketing Predictions will help you develop and document your plans. 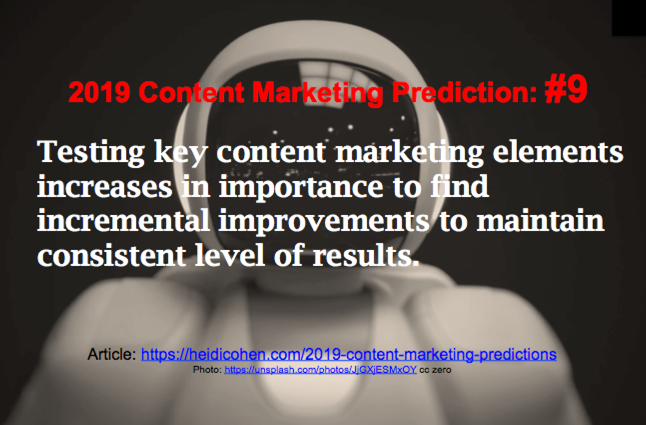 To make the case to management, we provide the relevant data you need and actionable content marketing tactics to get your 2019 content marketing strategy on track for success. 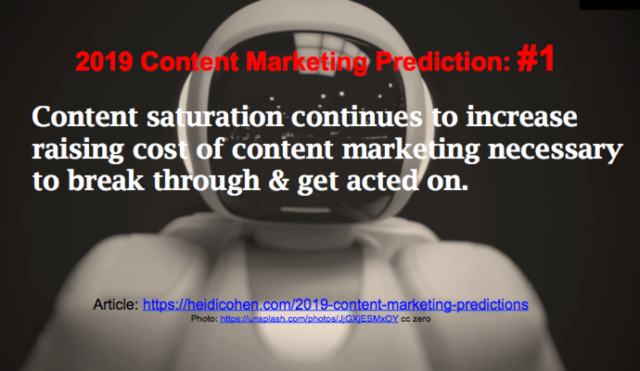 Content saturation continues to increase raising the cost of content marketing necessary to break through and get acted upon. In BuzzSumo’s 2018 Content Trends Report, Steve Rayson proved that content saturation already exists in many major information categories. The average 2017 content marketing article attracted only 4 social shares, down 50% from 2015 findings. 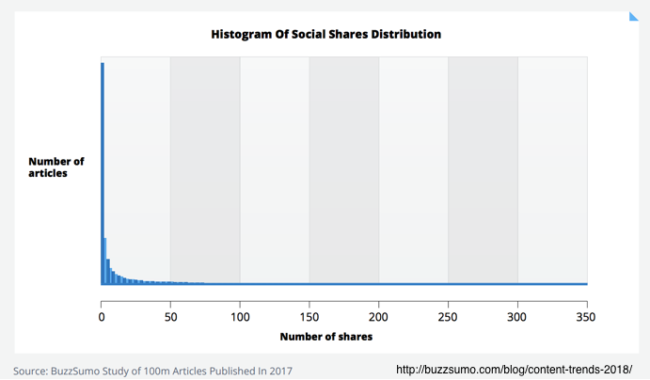 Since the BuzzSumo data excluded content with no shares, the 4 shares understates reality. 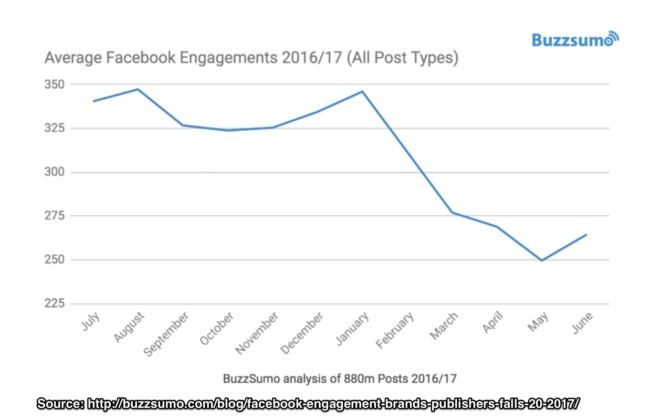 These results are consistent with the 20% drop in the average number of engagements per Facebook post during the first half of 2017. The median number of backlinks attracted in BuzzSumo’s 100 million article sample was 0. 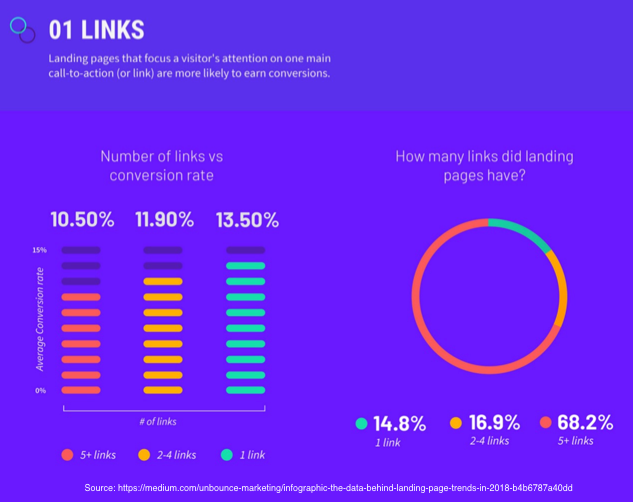 In fact, 70+% of articles never received even 1 backlink! Viral media darlings like BuzzFeed, Upworthy, Vice and Vox had major traffic falloffs. Traditional journalism based media including The New York Times, Harvard Business Review and The Economist increased traffic due to a “flight to quality”. Increased competition for audience attention carries a BIG content marketing price tag! Without an owned audience and vetted foundational content, you spend more to create, optimize and distribute content that will reach fewer people. Despite this, prospects still need 6 to 8 content touches before they become a lead and enter your sales funnel! You still need to convert them to paying customers. 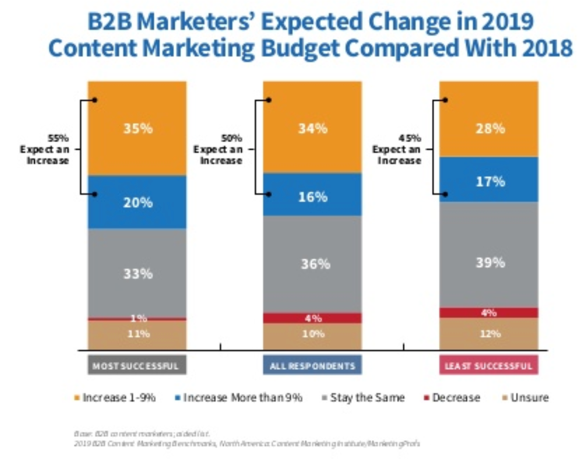 While marketers expect larger content marketing budgets in 2019, they must improve resource utilization to show that the investment attracts and nurtures leads that convert to profitable sales. Extend content viability over time. Instead of creating new content, improve and transform pre-vetted content. Use content audits to keep content relevant and increase traffic. 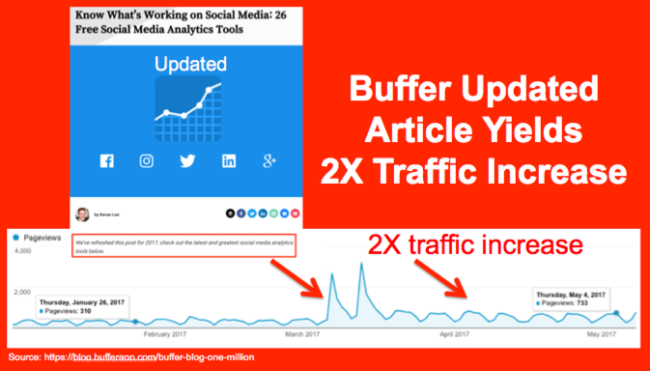 For example, Buffer’s updated blog posts doubled traffic. In 2018, consumer trust hit a new low as reported by the Edelman Trust Barometer. 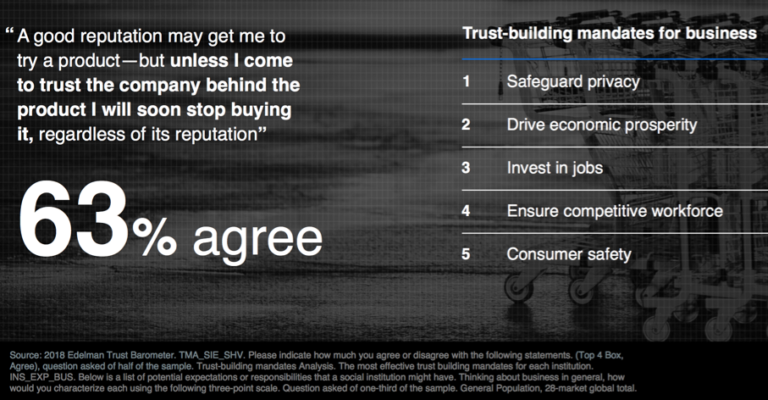 Even worse, 42% of respondents don’t know which companies or brands to trust! 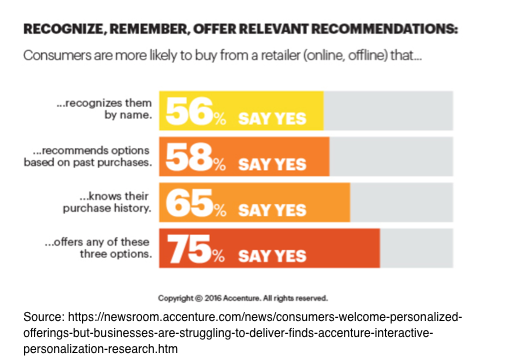 As customers become savvy about protecting their personal data, businesses must provide personalized experiences in exchange for audience information according to Accenture. Consumers hate “spam” and define it “as information that’s not relevant to me.” It doesn’t matter if they opted into your messages at some point when it seemed important. According to Statistica, spam accounted for 53.4% of global email traffic in September 2018. Segment your email and other communications to deliver targeted messages. 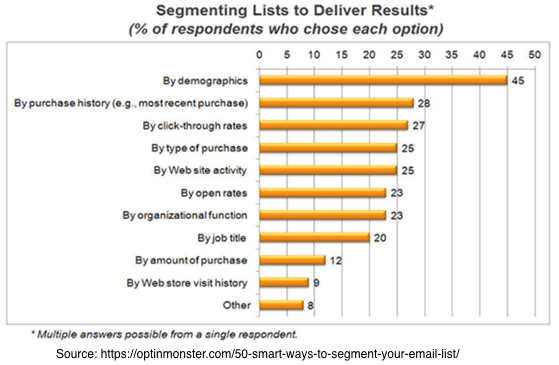 Most email providers offer basic Marketing AI to improve personalization. Build communities either on owned or social media to build relationships. Popular options include LinkedIn Groups, Facebook Groups and Slack. Onboard new customers to use products and services. Expand customer relations to include end-users and others. Sell additional product, cross-sell related products, or upsell other offerings. Encourage advocacy and new referrals. Since acquiring customers online costs more than offline, the growth of profits from these customers increases at a faster rate according to Frederick F. Reichheld and Phil Schefter. 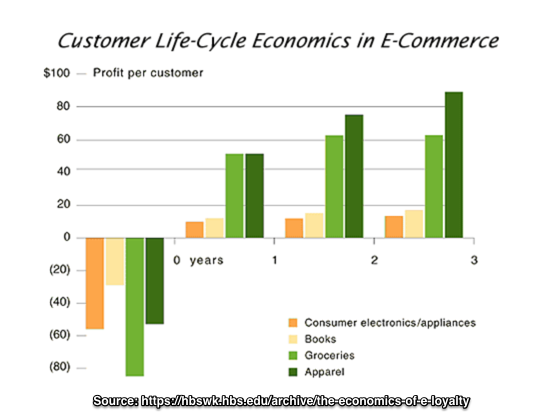 As a result, repeat online clothing customer spend in months 24 to 30 exceeds twice the first 6 months. 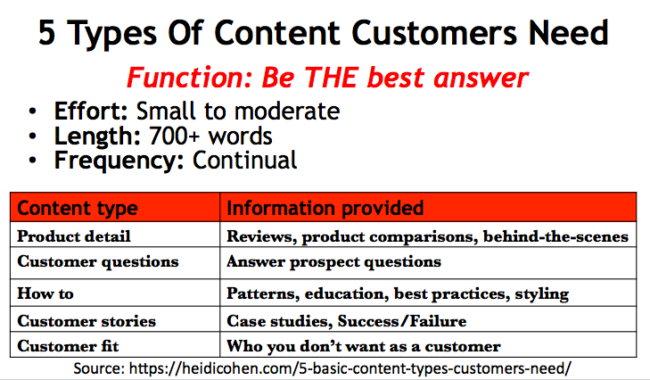 Post-sales content already exists within your company. In most cases it just requires different presentation, targeting and automation. Audit existing content for information to support initial trials to build customer satisfaction and to encourge advocacy. Start with FAQ information. Transform existing content presentation to address post-purchase needs. Create welcome communications series to support new users. Expand and tailor content delivery to end users and others. 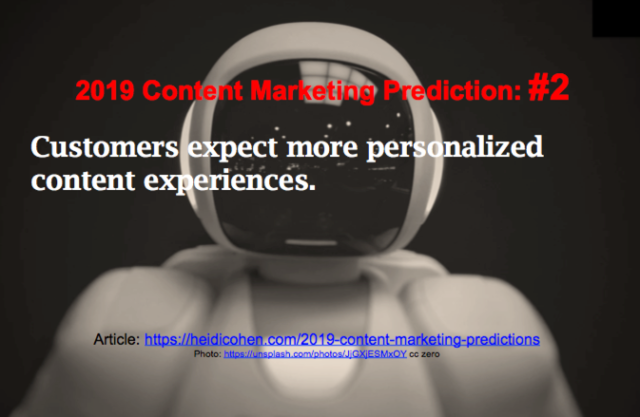 Due to the use of more devices and screens tailored to personal and environmentally relevant needs, content consumption patterns continue to change. 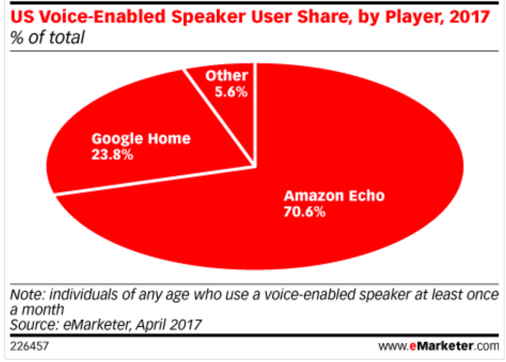 Uses a variety of devices to consume content including smartphones, tablets, kindles, voice enabled speakers, televisions, car-related devices and other out-of-home and Internet of Things options. Seeks content formats such as text, images, photos, video, audio (including podcasts) and webinars depending on their physical location. Searches via different options including location, voice, image and video. Since your potential audience fills otherwise wasted time with on-the-go content, they actively seek both snackable and binge-worthy content. As a result, video and live-streaming remain white hot. Also, audio content consumption (especially music and podcasts) continues to increase. Recycle existing content into new budget-friendly content. Continually transform road-tested content into other formats to reach new audiences and increase consumption. The New York Public Library (aka: NYPL) transformed classic books into interactive offerings on Instagram. 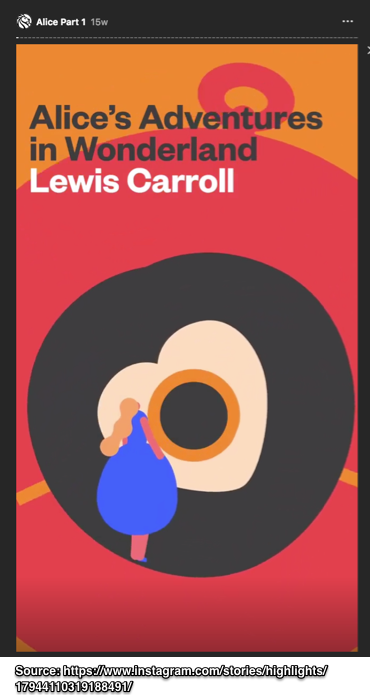 To date, Alice In Wonderland has attracted +50k views. 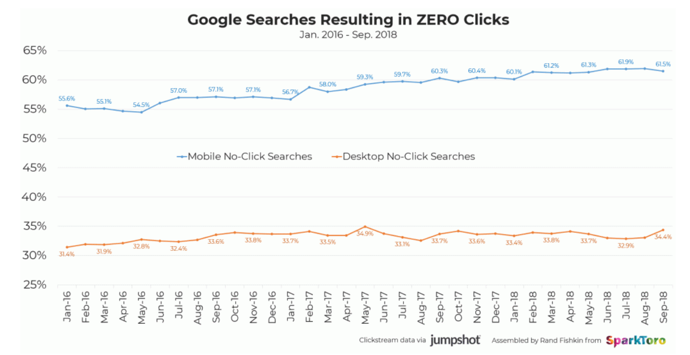 Search continues to evolve requiring more specialized resources, tools and paid advertising. YouTube is NOT the #2 search engine anymore! This makes sense since Google smartphones helped to crowd-source image identification. 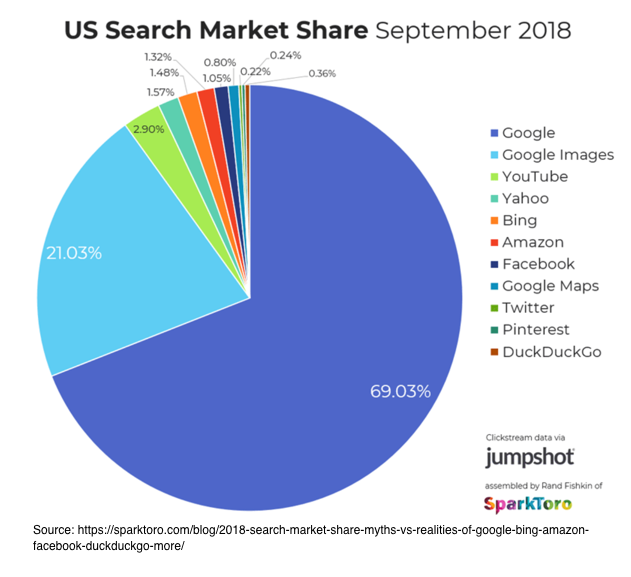 Beyond Google and other obvious search engines, consider “non-search” options such as Amazon for purchases, Apple for podcasts, Netflix and Amazon Prime for video and review sites like Yelp and TripAdvisor for purchase. These alternatives use voice, image, video, audio and shopping search. Support search success with brand awareness, authority, and quality user experience. Include related terms in your content. Since search no longer depends on exact match words. Recommended tool: Ubersuggest. 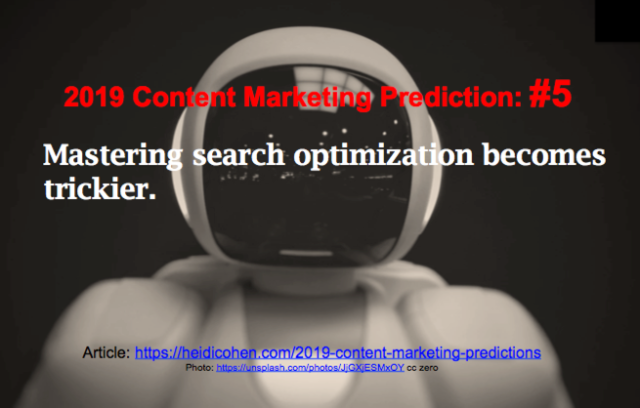 Optimize every element of your content for search. Include images and other formats. The 2018 content distribution reality: No free distribution options remains. No new media platforms or distribution options emerged or gained sufficient traction to break into the top tier media entities in 2018. Instead major players consolidated their existing entities to remain dominant. Having matured, social media entities need to show financial returns for investors. Further, most networks with the notable exception of LinkedIn depend on a single source of income, advertising. While Facebook continues to dominate social media, its organic reach continues to tumble. Users are concerned about Facebook’s handling of their personal information. Further, teens and college students no longer spend time there. Beyond distributing content organically, invest in Facebook advertising to remain visible and yo tap into its powerful data. Instagram received increased attention as users leave Facebook. But it remains a challenging platform for content. Further, Flickr may be returning from the dead. Create photo-based content to attract attention on Instagram. LinkedIn continues to attract attention for social media content, long form text and native videos. LinkedIn comments, likes and shares increased over 60% in 2017 (Digiday). But, LinkedIn has allowed Slideshare to whither. Syndicate long form content to LinkedIn Publishing. Include: Pinterest (It acts like a search engine for shoppers). Reddit, Growth Hackers, Facebook Messenger and Slack. 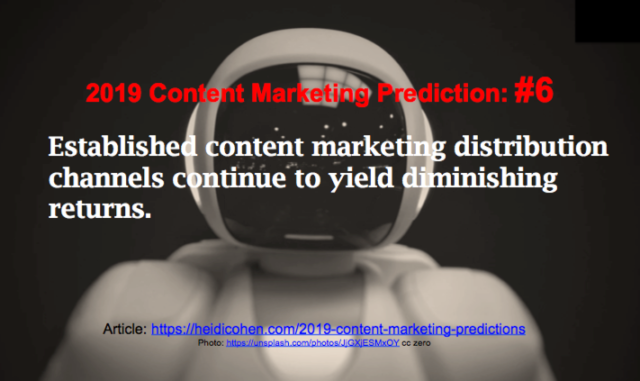 In 2019 content distribution evolves from a campaign mentality to continuous promotion. Regularly change content distribution presentation to remain fresh and eye-catching. Offer additional content formats to extend reach to new audiences. Syndicate owned content on Medium, LinkedIn Publishing and other third party sites. Transform vetted ideas into guest posts. Allocate budget for social media and third party advertising and remarketing. Test native advertising to access new audiences. And you don’t need to create content! Create related distribution presentations and other formats with initial content where possible. Use secondary social media platforms to ignite your mega-content distribution like Nadya Khoja. Participate in online communities related to your core topic to build your network. 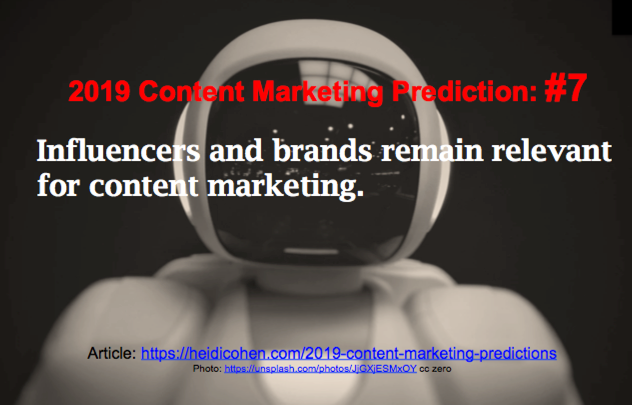 In an era of increased transparency and scrutiny, past and present missteps of influencers and celebrities can hurt your content marketing. Work with micro-influencers who have deeper connections with their followers. Since they have stronger sway with smaller followings, you may need to work with more influencers. Take advantage of the power of your audience and employees to influence their connections, but put a set of social media guidelines in place first. Empower employee advocacy where appropriate. Create processes and programs to help them distribute your content. Use influencer outreach to create content and support content distribution. Incorporate tracking in your influencer marketing. In the wake data misuse, privacy issues and fake news consumer trust eroded between 2017 and 2018. As a result, consumer and government scrutiny may hinder your ability to collect information. Content marketers need audience information to maintain communications. Otherwise a small internal policy or algorithm change at a tech giant can leave you without access to data, reduce search rankings or create other revenue challenges. Potential readers and prospects may never visit your site! As a result, your ability to create a direct relationship by acquiring your audience’s contact details remains limited. 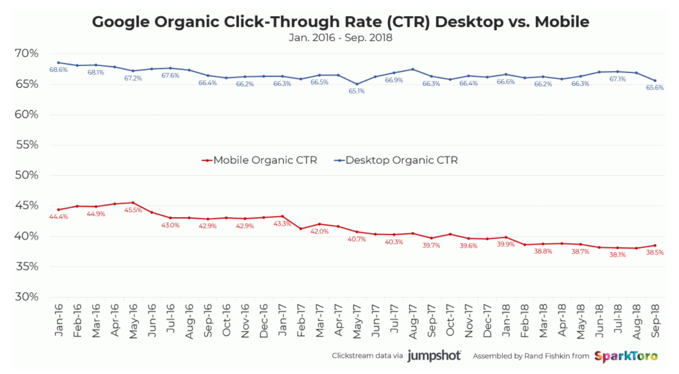 Because “no click searches” continue to grow while organic CTRs erode (Sparktoro). 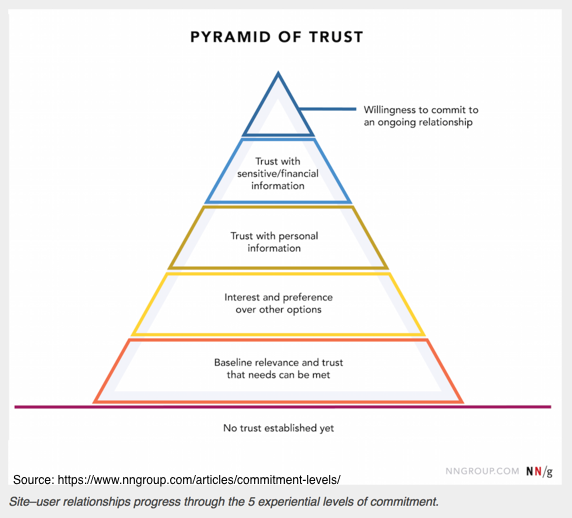 Build audience trust over time. Provide consistent content weekly or every other week. This creates Share of Audience Attention to help content get found and consumed. 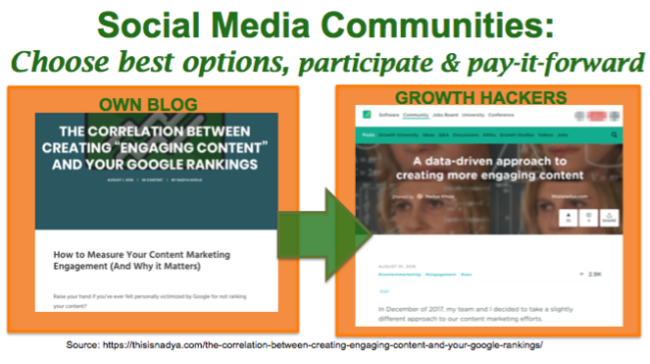 Use a mix of platforms and content formats to help keep content visible. Don’t limit content distribution to one channel or format. Update quality content to remain visible and findable. Focus on your best performing information since it costs less to modify and distribute. 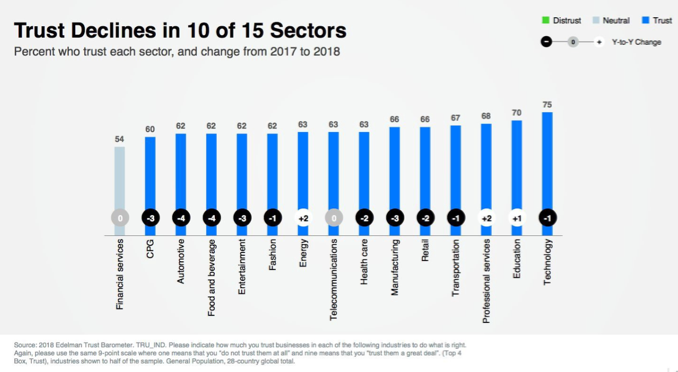 Don’t assume that what works now will yield an acceptable level of business results in 2019! Despite producing higher cost 10X content, you need more budget for increased distribution costs to cover additional presentations and advertising to stand out. To improve results, budget to continually run content marketing A/B tests. Further, start with the elements that yield the biggest results. This includes calls-to-action, landing pages, and conversion forms. Document, publish and share your content marketing strategy across your organization. Ensure that it’s aligned with your business mission and goals. Use tailored landing pages. 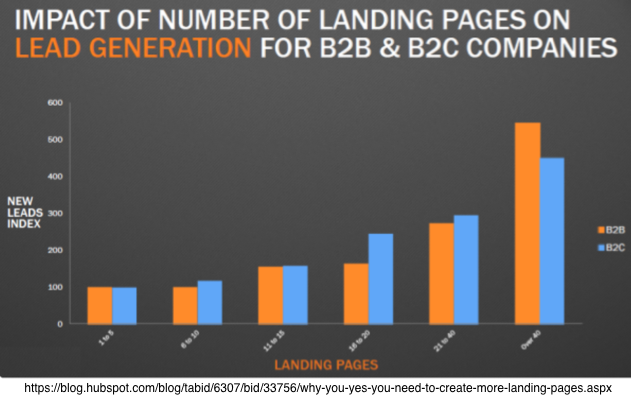 Make your landing pages consistent with your content. 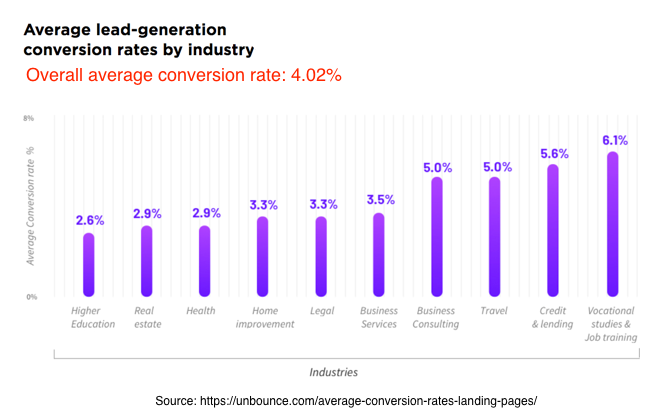 Increase the number of landing pages to over 6 to significantly improves results (2010 Hubspot Research). Vanity content marketing metrics are no longer acceptable! 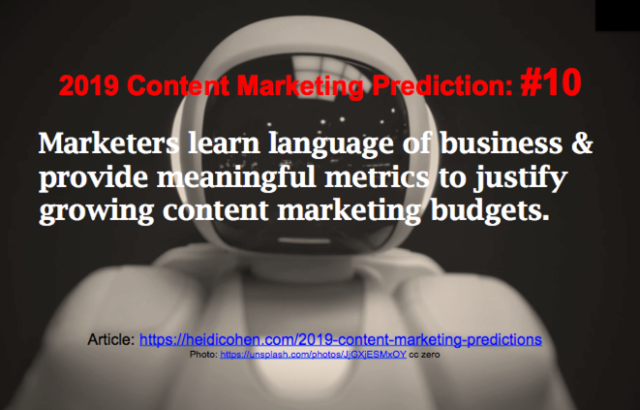 To keep and grow your content marketing budget, not only show management your stellar 10X content but also explain your results in business terms. Translation: Show that your content marketing contributes to growing profitable sales. When I worked at CheapTickets, the CFO loved that I translated results into financial terms he understood. Translate your content marketing results into financial terms. To win over your CEO and CMO, increase qualified leads and convert them into paying customers. Further, revenue generation must exceed your marketing costs even under difficult market conditions. Develop lifetime value calculations. Understand the value of each customer you acquire over of time. Start with a rough estimate and continually refine it. 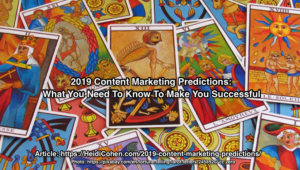 Regardless of the size of your business or marketing budget, adapt your plans based on these ten 2019 content marketing predictions. Otherwise you risk that your content will become irrelevant or buried from view. 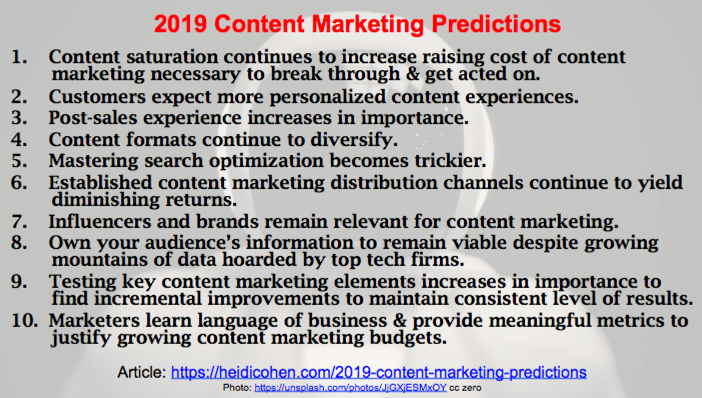 You can transform your 2019 content marketing strategy and plans by understanding next year’s competitive landscape based on these predictions. You no longer compete just against direct competitors! Since target prospects and their purchase influencers also compare your products and services to near substitutes including free options and/or totally different ways to spend their money. Therefore keep your content competitive and relevant by creating a game plan for next year using these ten 2019 Content Marketing Predictions. 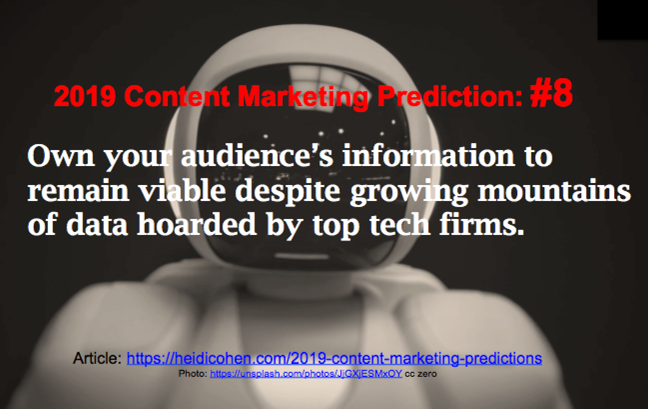 Tags Accenture, BuzzSumo, content distribution, Content Marketing Institute, Edelman Trust Barometer, Facebook, Influencers, Instagram, LinkedIn, Marketing Metrics, Rand Fishkin, retention marketing, Search, SparkToro, Unbounce. Bookmark the permalink.